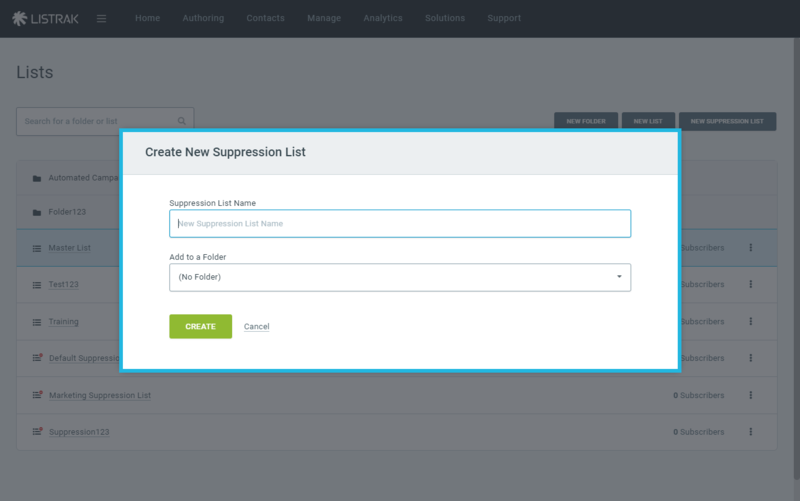 Learn about suppression lists and how to best use them. In order to remain compliant with the CAN-SPAM Act of 2003 contacts must be able to unsubscribe from receiving emails. After a contact unsubscribes, they should not be resubscribed to the list. Multiple marketing lists can be tied to a single suppression list. When a contact unsubscribes from a list that has a suppression list linked to it, that contact will be unsubscribed from all lists also tied together by that one suppression list. A default suppression list is created in every Listrak account. This list does not have to be utilized, but it cannot be deleted. 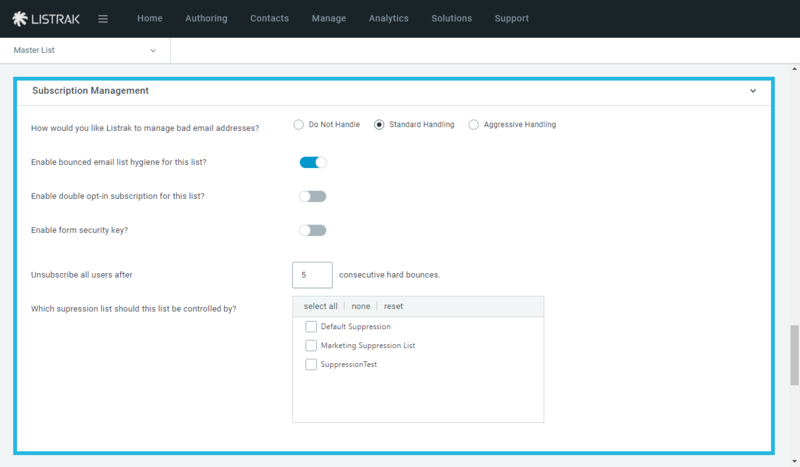 If you do not see the default suppression list in your account, then you most likely do not have access to this suppression list and should contact your account administrator to gain access. NOTE: If you only utilize a single marketing list, it's not necessary to use suppression. Unsubscribed contacts will be sent to the unsubscribe table specific to the list they unsubscribed from and will not be sent email in the future. 4. Click New Suppression List. 5. Enter a name for your suppression list. 6. Add to a folder, if applicable. 1. Click on the list that you'd like to associate with your suppression list from the panel on the left-hand side of the home menu. 2. Navigate from the home menu to Manage. 5. Scroll down to the Subscription Management Settings section. 6. Under Which suppression lists should this list be controlled by? click on the suppression list you just created. 8. Repeat for any additional lists that you'd like to have controlled by your suppression list.